The History and Archives Committee of the JCCCM has collected and produced a variety of printed materials, such as correspondence files, calendars of events, newsletters, and pamphlets that have been alphabetically arranged according to subject. 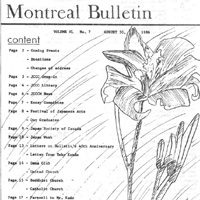 Additionally, the collection contains personal or biographical files, as well as a complete set of the monthly publication, Montreal Bulletin, which commenced publication in 1946. 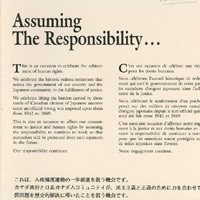 The subject files cover a range of topics including Redress in 1988, the Centennial Celebrations in 1977, as well the activities and projects of the History and Archives Committee. 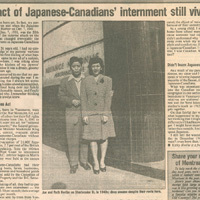 The collection also consists of detailed personal or biographical records, compiled during the 1980s, which contain interview transcripts, audio-tapes of the interviews, as well as additional biographical information pertinent to the experiences of Japanese Canadians in both the Montreal region and the larger Canadian context. Click on the following links to see sample documents from the collection.